Dental Implants in Ottawa by Vista Dental and Denture Clinic are surgical components that are inserted into the bone of jaw or skull to support a dental prosthesis like a bridge or a denture. It is a Titanium post that is positioned beneath the gums so that dentists can feasibly place replacements inside the mouth of the patient. 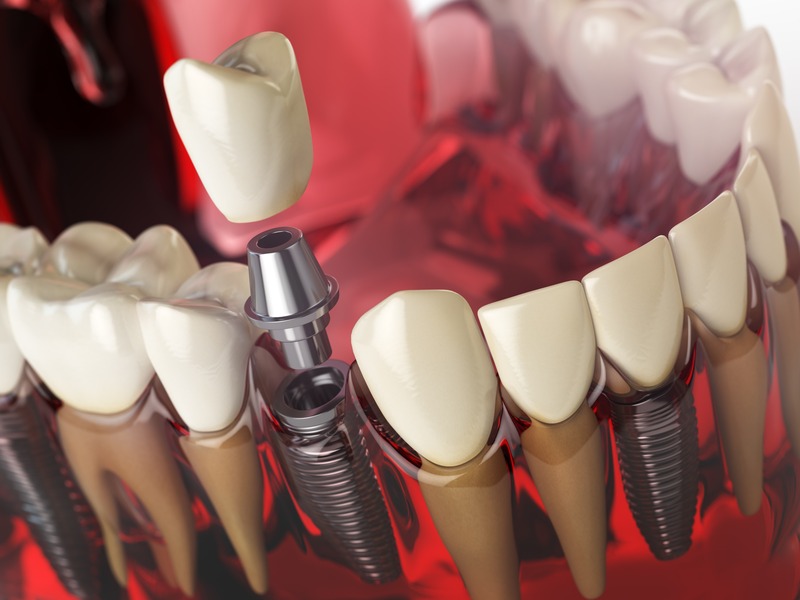 These implants also benefit the oral health of the patient. However, you must have sufficient bone in your jaw and healthy gums to support this procedure. For all those people who suffer from poor ridges and sore spots, regular bridges and dentures are not possible. These implants are simply a blessing for them. Planning for dental implants focuses on the general health condition of the patient, the local health condition of the mucous membranes and the jaws and the shape, size, and position of the bones of the jaws, adjacent and opposing teeth. There are few health conditions that absolutely preclude placing implants although there are certain conditions that can increase the risk of failure. The prosthetic phase begins once the implant is well integrated (or has a reasonable assurance that it will integrate) and an abutment is in place to bring it through the mucosa. Even in the event of early loading (less than 3 months), many practitioners will place temporary teeth until osseointegration is confirmed. The long-term complications that result from restoring teeth with implants relate, directly, to the risk factors of the patient and the technology. There are the risks associated with esthetics including a high smile line, poor gingival quality and missing papillae, difficulty in matching the form of natural teeth that may have unequal points of contact or uncommon shapes, bone that is missing, atrophied or otherwise shaped in an unsuitable manner, unrealistic expectations of the patient or poor oral hygiene.